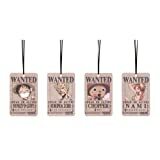 Car Mate USA presents this one of a kind collection of all-purpose air fresheners featuring Monkey D. Luffy and his ever wily band of straw hats. Series one of this set includes Luffy, Roronoa Zoro, Nami, and Doctor Chopper. All lovingly designed by the folks at Toei animation, the straw hats are now ready to hit the road in style. These 2 x 5 inch collectibles are perfect for the fan on the go. Aside from the car, can be used just about anywhere, from restrooms to bedrooms. Celebrating ten years on TV, the one piece property is as strong as ever. The fragrance is a cool, long-lasting mixture of squash and lemon, making it an ideal companion for those long journeys.